Message Systems has just been named a top trusted website in the OTA’s 2013 Online Trust Honor Roll for demonstrating exceptional data protection, privacy and security best practices. We have more details about the Online Trust Alliance and the criteria for qualifying for the honor roll in our official press release, if you are interested in learning more about the background of this recognition. 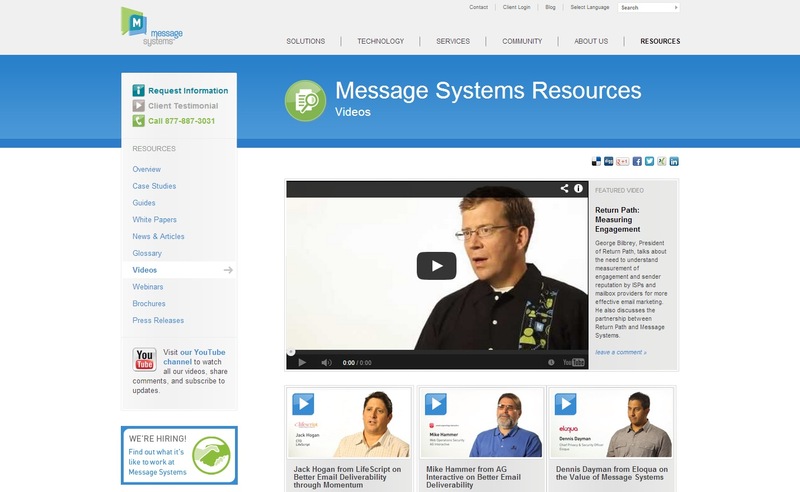 But today’s post is really in honor of the Message Systems website that was updated with a fresh new look in 2012. And here’s the website in 2012. So what’s changed between 2011 to 2012 website-wise? Cleaner look and feel, with much stronger branding. The logo and company colors have been updated to translate better from our live and print identity to our digital identity. 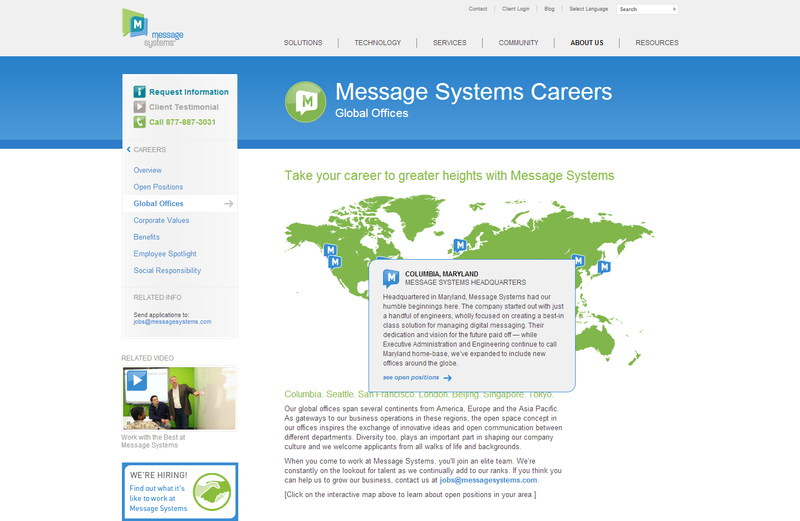 Full systems integration allowed Message Systems to track, score, and analyze every lead that came through the site. 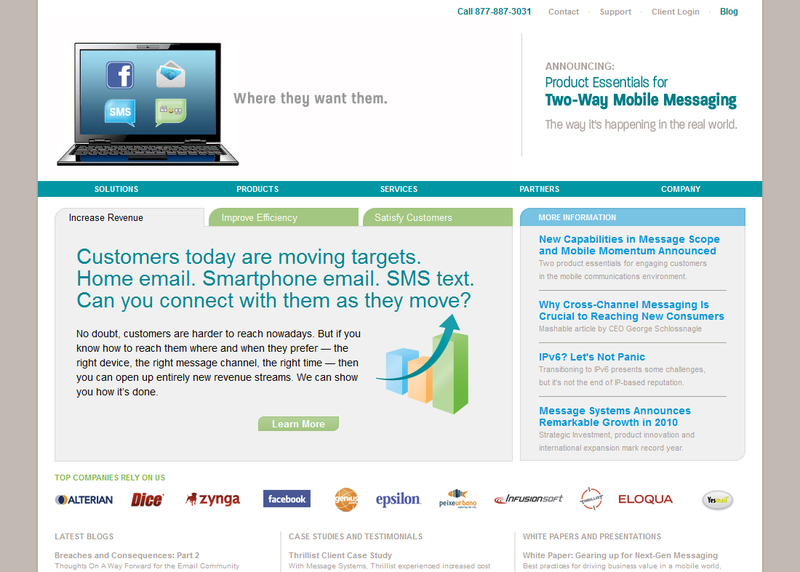 More consistent calls to action and results for clicking on them across the site. No one should be taken off guard by where they end up after clicking on a link. New videos page to display client testimonials and other features that were integrated with our new corporate YouTube channel. In addition, the webinar pages have been upgraded for better usability and consistency with the new video format. 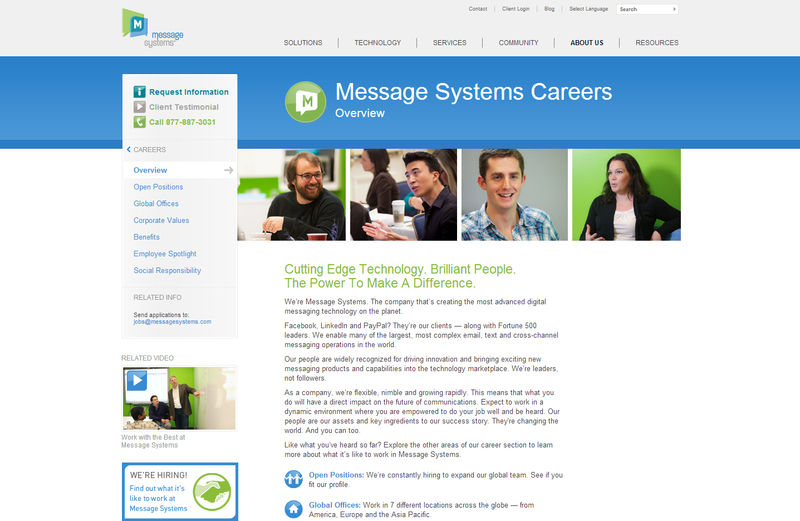 The upgraded careers section of the site drives recruitment efforts and showcases the excellent company culture. New social media sharing features for targeted outlets (including Facebook, LinkedIn, and Google Plus) using the ShareThis service combined with selective PHP insertion. Tons of new SEO features like schema tagging, tracking tokens in URLs, and dynamic meta tag generation. All coded in a user friendly way for content managers to easily use. Rolled back several “form walls” where we required users to provide their contact information to view certain collateral. Those forms are now only used for “best practices” and other “how to run your business better” kinds of guides that content managers work very hard on, and can greatly benefit the user for free. Upgraded the company’s Blog Theme (WordPress based) to better suit these website changes and to enable several of its new features into the blog portion of the site. Site traffic increased by over 400% 6 months after the redesign. Sales Qualified Lead Generation originating from the website increased by 80% in 2012. Social media integration throughout the website together with increased social media activity led to 20% more followers on Twitter and LinkedIn. While the re-launched website made sense from a dollars and cents perspective, its recognition by the Online Trust Alliance also validates the commitment Message Systems has in safeguarding all visitor information and protecting customers from the increased threats posed by cybercriminals. Being named to the 2013 Honor Roll is a significant achievement considering the large number of companies that received failing marks for inadequate domain and consumer protection (14%), insecure websites (7%) and inadequate privacy policies or data collection practices (36%). This is especially true since many large e-retailers with significant sales have failed to make the Honor Roll. 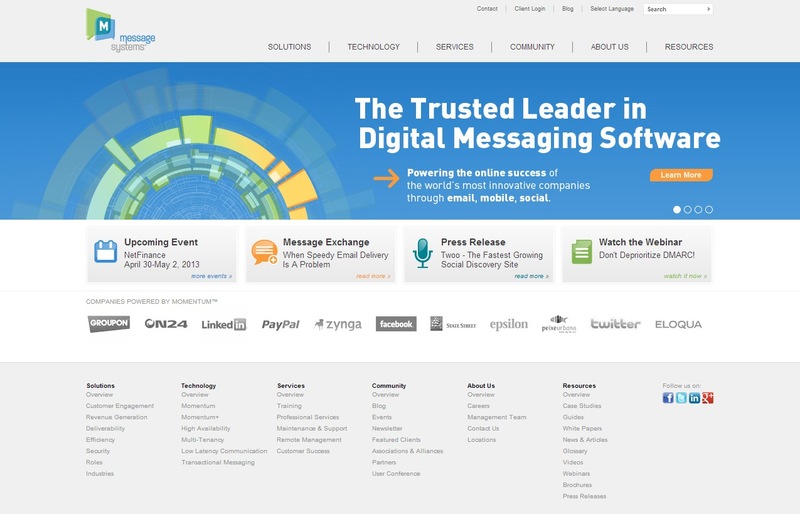 Message Systems is also the only on-premise email software company to make the list. In short, there’s no better way for the website and Message Systems to be recognized for demonstrating leadership in brand protection, online security and privacy best practices. As a final note, I would like to thank the OTA and Craig Spiezle, president and executive director of the Online Trust Alliance for their assistance in building the site to achieve this goal. They responded quickly and helpfully to every question I asked them and we couldn’t have done it without them! We’ve taken you through some of the key features of our website optimization process, why not look at how you can optimize your emails as well? Download the Email Best Practices 101 eBook to increase your chances of getting into your customer’s inbox. Great overview Corry. Thanks for posting. I had no idea our traffic had increased 400% after the redesign. That’s amazing. And congrats on the OTA award!